Celebrating the fantastic Trans Sports Initiative (TSI) at the University of Dundee. Hey Folks, welcome to TSI’s official blog platform. TSI was set up to try to encourage more transgender and gender non-conforming people back into regular sport and exercise. Based in Dundee, the DULGBT+ Society has teamed up with the ISE (Institute of Sport and Exercise) and the University of Dundee to bring this project to reality. 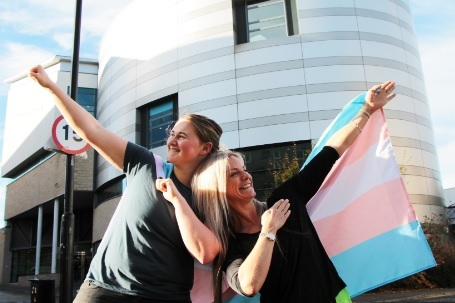 We have started a pilot project for Trans and Gender non-conforming students who find their gender identity to be a real impairment in accessing the Gym or sports teams. The ISE have agreed to give every person who signs up a free gym membership to the ISE for 4 weeks, as well as an introductory induction session and two sessions with a Personal Trainer. (All of this would usually cost about £65 just for the PT). All personal trainers will be Trans awareness trained from our friends at the Scottish Transgender Alliance – so they will understand the importance of correct pronouns, dysphoria, and other possible issues. The Ideology behind TSI is that regular exercise and generally good physical health are some of the best ways to maintain good mental health and dealing with Gender Dysphoria, becoming more body confident and to prepare for possible surgery. Get rid of this idea what we are born in the wrong body. This body is your own, it is the only one you will ever have, or ever will have. Even just the simple thing of having a routine, that regular exercise, the regular endorphin’s, all of this has benefits to your mental health. It will not stop your dysphoria. But it will help manage you manage it. Any individual who signs up can get 4 trials at the Dundee University Gym (ISE), an introduction session to get a look around and 2 sessions with a personal trainer to help show you around and help you get the workout that will work with you, whether you are a beginner or a pro. All for free. This way you can see if this is a technique / coping mechanism that will work for you, without having to spend all your money on a gym membership you then never use. We will have a committee member happily accompany you to the induction so you can look around the facilities and talk with your PT to work out whether it is something you would be interested in. Then, once you started, we will have a buddy system for workouts to encourage new members, making the gym experience less intimidating. We are also so excited to be working in collaboration with LEAP Sports and hope to do possible collaborative events with them in the future. If you are interested, please email us with your name (legal and preferred) and your student number. Once we have numbers for how many people are interested, we will work out times with you to then get you started! Written by Alex Muir (TSI) on 14th June 2017. Alex is a politics graduate from the University of Dundee (2017). He has been the Trans liaison officer for the LGBT+ Society and the LGBT+ SRC representative for the last year. He is currently the Vice President of Representation for Dundee University Student Association. Alex started up Trans Sports Initiative (TSI) as a pilot in his fourth year to try to encourage Trans and gender non-conforming students to get into sports and the gym. He is currently looking at expanding the project by working with the Scottish Trans Alliance to train the Sports Union and get more university sports teams involved, as well as eventually expanding to encourage other universities to adopt similar projects.